seen these before hav'nt everyone? well here's a new one i will see if i can keep finding new ones so hopefully we can get someone to guess them all and they get a prize if you can list all the legs for which character? well i know for a fact that at 1 oclock thats Ika Musume. do I get like 1 tenth a prize? Well using Ika as number 1, 6 is Lala Deviluke. Next to her in 7 is Rin From FSN. 11 Is Lina Inverse and of course 15 is Belldandy! Could go on but wont spoil it for others..
signature removed irredeemably by court order for being massively overloli. have a nice day. Madman wrote: Well using Ika as number 1, 6 is Lala Deviluke. Next to her in 7 is Rin From FSN. 11 Is Lina Inverse and of course 15 is Belldandy! Could go on but wont spoil it for others..
Anime collection HDD1: 552GB / 931GB Still going up. Anime collection HDD2: 804GB / 931GB Still going up. Is there anyone here, other than me, who knows more than 7 of these?? Starting from the top and going clockwise. He's basically saying all of those I picked were right. And damn am I having a hard time picking the last three. None of those clues are even clicking with me. I've seen characters that look like them, but the clothing is slightly out for all of those. you're neglecting your inner powerz!!! you can do it!!! its all for it!!! prove the night and stay up and finish it! or does mappy give up? Nope. I just don't know. Mappy wrote: Nope. I just don't know. so you admit you can't get them and i can spoil the last 3? If looking up "blond hair and plaid skirt" doesn't give any character for 14, "blue skirt and lab coat" for 9 and "black stockings and bead belt" for 4, then there really is no way I can answer those three. Yukihiro Ayaka from Negima and Kageyama Torako are the best I can choose for 14. 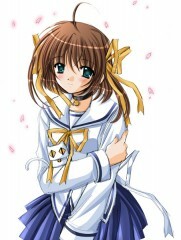 Kouriyama Aki from Tokimeki Memorial is the best I can choose for 9. Mappy wrote: "blond hair and plaid skirt"
Cough! foxtail COUGH COUGH!!!! answers will be up in a minute? Wow, now that gives me Noumi Kudryavka from Little Busters. Big step forward, considering the uniform is wrong. well don't you feel like you got egg on your face! I've never watched Kanokon (I've never wanted to), so I only know Chizuru as having dark hair. She did come up in the search, though. Guess what I discounted? Nemu rarely wears the coat. Guess what I also discounted? Dunno yet. Give me time to think. Mappy wrote: Dunno yet. Give me time to think. See, I used to think that, but not any more. If a show has no redeeming value when you watch it and it's not your actualy job to, why bother? There's no point in spending leisure time on something you hate doing. It means it's not leisure. I can't say I hated They Are Our Noble Masters, just that it didn't make enough of an impression on me to remember it all this time down the track. I keep a record of shows that I watch, and there are some that just leave me scratching my head, trying to remember what they were about. Like Piano, Canvas 2, Okusama wa Mahou Shoujo, Nanaka 6/17, Yume Tsukai, Narue no Sekai, Binbou Shimai Monogatari, Kagihime Monogatari Eikyuu Alice Rondo, Ar Tonelico, Chikyuu ga Ugoita Hi, Giniro no Olynssis, Touka Gettan, Joshikousei, Happiness!, Kemeko DX, Earl and Fairy, Asu no Yoichi, World Destruction, Tactical Roar, Early Reins, Kanamemo and Prism Ark. When you have as many anime rolling about in your head like I do, some are bound to fall into the chasms of forgetful old age. Now I know why I didn't recognise a single one - on top of the fact recognising that many females from the waist down should be an arrestable offense. A list of merde shows.